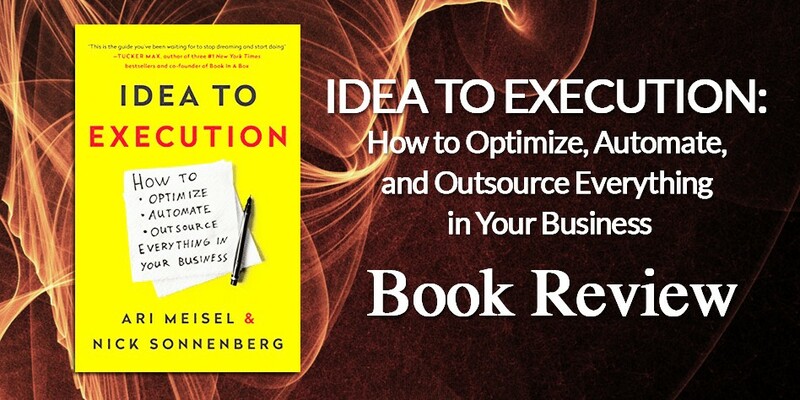 I’m going to admit it, the subtitle of Idea To Execution totally sold me on the book – “How to Optimize, Automate, and Outsource Everything in Your Business”. This is something that I’m always looking for but even more so at this time of the year – as we start 2017, I’m looking at this as the year I scale Casual Marketer a bit more, so I figured this might be a good book to sink my teeth into. After the first couple of chapters, I came away feeling a bit frustrated. I felt that this book was pretty much an advertisement for the business that Nick Sonnenberg Ari Meisel have set up to do outsourcing and virtual assistant services for people. I was really exasperated about three or four chapters in, I was seriously considering abandoning this book and just reading something else. I was riding the bus, listening to the Audible version and I just turned it off. I figured I’d take a bit of a break from the book and come back to it the next day. That night I was reading someone reporting about their business progress on their website and it dawned on, what Idea to Execution actually is, it’s a series of monthly summaries of the progress of Sonnenberg and Meisel’s business. Each chapter has a set format that talks about technology they implemented, how much revenue they earned and then there’s a bit of narrative about what went on. Once I saw the pattern it became palatable to continue reading the book. And I say “palatable” intentionally because honestly, there’s nothing really in the book that hooked me. As a reader, I don’t really care if their business succeeds or fails, I’m reading the book for what I can get out of it. Are Monthly Updates Really A Book? The short answer is that I didn’t get much out of it. I heard them talking about changing a lot of tools and there was much talk about automation and process, but they didn’t really deep dive into it at all – in fact, the subtitle was pretty misleading because unless the answer to “how” is to outsource to them, you really don’t really get much beyond a superficial overview. At one point they talk about this big customer, a real guru in the personal development space, who they were engaged by to work with his company. They can’t name said guru because of an NDA, so the whole discussion is kind of pointless as it meanders through several chapters (months in their business) where they bumble their way through figuring out their business model and how and what to deliver for clients. This book actually demonstrates for me why the whole “minimum viable product” approach to building a services business is really a poor decision. Throughout Idea to Execution you can see them chopping and changing their business model, their focus and sometimes even what they think their core offering is. You could argue that by they end of the book they are doing about $100,000/mth in revenue so the results are there. Irrespectively, I just didn’t come away convinced about the story they were telling and I didn’t necessarily feel that it helped me. I’m going to say that like in most things in life, your mileage may vary. Once I realised that Idea to Execution was like a series of monthly income statements that you see some bloggers and podcasters put out, then it made it easier to read. But being easy to read doesn’t necessarily make it worth recommending. I just don’t think the value was there. To me, this was a series of monthly status updates on a blog about people starting their own online business. The big promise of learning how to optimize and automate your business is never really delivered on. It’s not a “bad” book, it’s just underwhelming and I kind of had this feeling the whole time that the book was just a marketing exercise for their VA business. You might see it differently, but with all that said, it’s not a book I’d recommend.